"Aside from James Bond and Miss Moneypenny, only a very few of people in the world have seen these cars in person," said Moreno. "During Cleveland Royale, these incredible rides will be for your eyes only." The Cleveland Auto Show is about to get shaken … and stirred. 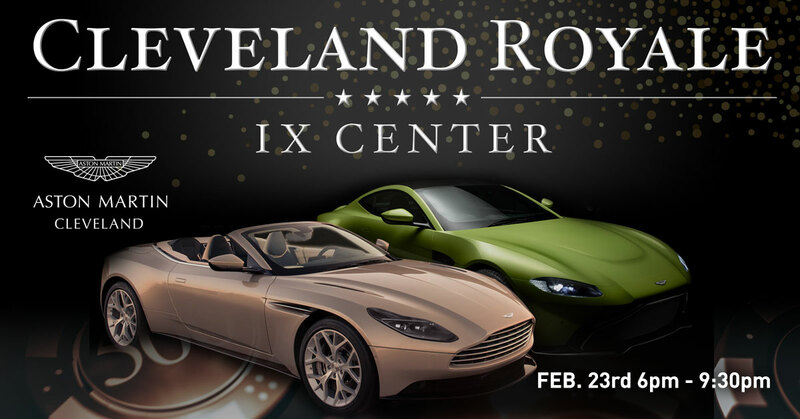 On the first night of Northeast Ohio's most popular annual automobile showcase, Bernie Moreno Companies is transforming the I-X Center into "Cleveland Royale" - a James Bond-themed black-tie-optional casino event, complete with hand-shaken martinis, dealer tables and an exclusive first peek at two unbelievable guests of honor: the new 2019 Aston Martin Vantage and 2019 Aston Martin DB11 Volante (convertible). This INVITE-ONLY event is Friday, February 23, from 6p.m. to 9:30 p.m. at the I-X Center. Attendees will be able to buy into table games (for the benefit of the Cleveland Police Foundation) and exchange their chips for prizes and experiences, all donated by Bernie Moreno Companies and its partners. Attendees will also be the first car lovers in the Midwest to see these stunning new Aston Martin luxury sports cars up close and in person. Aston Martin sports cars have wowed audiences in at least a dozen James Bond films, most recently in 2015's "Spectre." Their stunning design, unparalleled performance and luxurious comfort are synonymous with the refined class of the world's most admired spy. "James Bond's Aston Martins are usually equipped with gadgets like ejection seats, flamethrowers and rocket launchers," said Moreno. "Bernie Moreno Companies' motto remains 'Above and Beyond Come Standard,' but customers will need to find an after-market supplier to add those options." The 2019 Aston Martin Vantage offers a 4.0-liter twin-turbo V-8 engine delivering 503 horsepower. It goes 0-60 mph in 3.5 seconds. Top speed is 195 mph. In addition to power and performance under the hood, the 2019 Aston Martin DB11 Volante (convertible) features a roof that takes just 14 seconds to lower, which drivers can do while traveling up to 31 mph. When: Friday, February 23, from 6 to 9:30 p.m.
Where: I-X Center, 1 I-X Center Drive, Cleveland. For more information or to set up an interview with Bernie Moreno, contact Ralph Stawicki, Director of Marketing, at 440-567-9144. In 2005, Bernie Moreno purchased a small, underperforming Mercedes-Benz dealership in North Olmsted and transformed it into the flagship dealership of his organization. After just one year, Mercedes-Benz of North Olmsted earned a prestigious "Best of the Best" award. It would go on to win the award for 10 consecutives years, something no other Mercedes-Benz dealer has ever done. In the meantime, Bernie Moreno Companies has become one of the fastest growing and most admired auto-dealership organizations in the country, earning awards for its growth, client service, community involvement and employee engagement.